Since discovering the wisdom of consuming elderberry shots and elderberry tea to strengthen our immune systems, we are finding wild elderberries in places unnoticed –under our noses but unnoticed until now. Having this sort of bounty allows us to experiment a wee bit, looking for new ways to consume more elderberries. 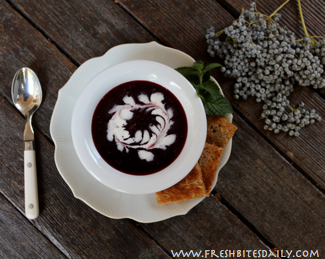 That’s how I came across this German recipe for chilled elderberry soup. Many elder recipes I’ve come across trace back to German roots. Does this make the German people highly immune to disease? Just wondering! Back to the soup. Elderberries have their own unique flavor that pairs well with sour additions like lemon or green apple. Elderberry-anything tastes more finished with acidic tones singing in the background. While this soup is sweet enough to be dessert, it is not cloying. It is a thin soup that feels heavy and satisfying, so there is no need to offer large servings. Serve it chilled, warm or at room temperature. You will have fine flavor at any temperature. A thin butter cookie makes a perfect accompaniment. Oh yes! 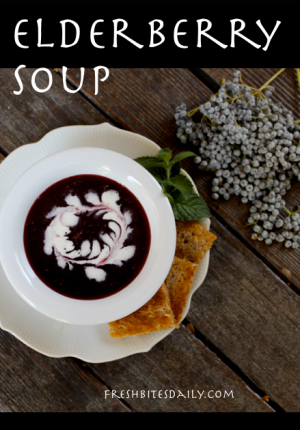 After making this soup from scratch as described below, I decided that I could make this soup from our home canned elderberry syrup. How about that idea in the mid of winter? Love it! Add the apple cubes to the cooking liquid and return to a medium heat. Cook the apples until they are almost finished. Add the strained berries, sugar or honey, lemon zest and lemon juice. Taste for sweetness. Adjust as necessary. Bring the soup to a simmer. Mix the thickener with the two tablespoons of water in a medium bowl. 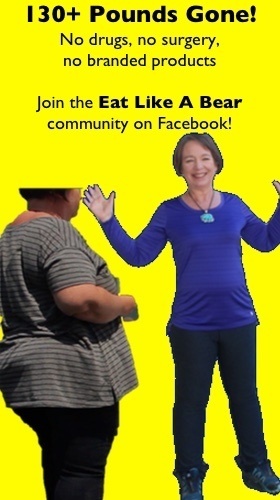 Break down any lumps. Slowly add about 1 cup of hot soup, stirring the whole time. Then slowing pour this mixture into the larger pan of soup, also stirring the whole time. Simmer for another 2-3 minutes while the soup thickens. To serve this soup warm, ladle soup into small bowls and drizzle with heavy cream to garnish. For a chilled soup, plan on about 4 hours in the refrigerator before serving. 2 Comments on "Chilled Elderberry Soup"
How timely… I just ordered one pound of dried elderberries from Mountain Rose Herbs and wondered what I’d do with it all. I’ve only ever made elderberry syrup for a medicinal, immune boosting tonic during Fall-going-into-Winter. And I’ve never used even a half pound for that.